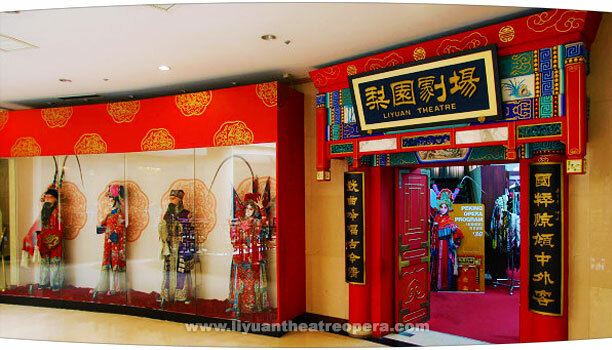 Liyuan Theatre lies in the heart of Beijing's former Xuanwu District located south from Tiananmen Square. Vibrance of the area has it's roots from the old imperial city; famous for being the birthplace of Peking Opera. The facilities of the theatre are inside the historical Qianmen Jianguo Hotel which was built after the foundation of The People's Republic of China in 1956 and later renovated in 2002. The theatre has hosted classic Peking Opera performances since 1999 with it's grand opera hall that can fit up to a thousand visitors. The hall has brought up the atmosphere through design and decorations similar to old Beijing opera theaters. These decorations include walls aligned with chinese couplets and calligraphy, opera masks and Chinese folding screens (pingfeng). 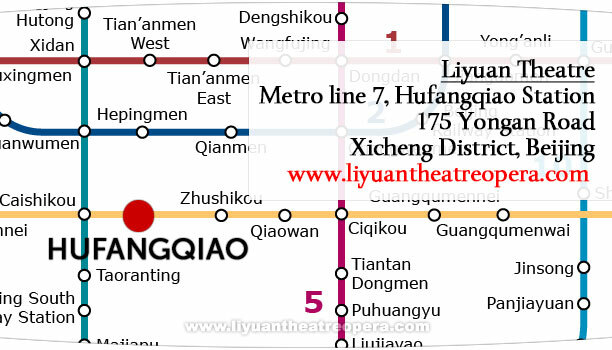 Liyuan Theatre, located in Qianmen Jianguo Hotel can be accessed by subway at Hufangqiao Station on line 7. Building is located a short walk from the metro exit C.
The audience is divided into regular seating and table seating. Those who wish to get the most out of the traditional atmosphere may choose one of the table seating options close to the stage. Classic Beijing snacks and tea are included with the table seats and also the regular seats offer refreshments for purchase. The tables are called the Baxian table which translates to "8 immortals table". It's a traditional wooden table that can fit up to 8 people. The story behind its name comes from the ethnic Bouyei population who originate from southern parts of China. Before the table came to existence, the Bouyei use to eat outside on top of rocks or wood. However this caused problems on very hot or rainy days. One such unfortunate day when the rain had spoiled the food of the villagers a group of 8 people arrived to the scene. They claimed to be their distant relatives and seeing the villagers soaked from the rain asked why they were eating outside. The relatives took pity of their problem and asked the locals to take the food back to the kitchen and go to change their clothes. As they returned to their guest room, it was fitted with square wooden tables and wooden chairs. The villagers were thrilled with excitement and asked the relatives to sit down on the best table. But as soon as one of the villagers proclaimed: "they are not our relatives, they are immortal fairies.." the so called relatives vanished into thin air. Their suspicion was confirmed, the fairies had indeed come to help them. From then on they always had dinner from these 8 immortals tables and the name and design was carried all around China up to the seating of Chinese opera halls. The performance is brought to you by one of the leading Opera Troupes in China: "The Beijing Jingjuyuan Theatre" which was founded in 1979 under China's Ministry of Culture. It is lead by four of the most historical Peking Opera actors of our times: Cheng Yanqiu, Mei lanfang and Xun Huisheng and Shang Xiaoyun. The theatre has also a gift shop where you can try out an opera dress or the masks and buy instruments, paintings, calligraphy etc. Any complete visit to Beijing includes The Forbidden City, eating Beijing roast duck and coming to Liyuan Theatre for a culture dose of Beijing tradition. Click here to book discount tickets to the performance!